If You Aren't Confused By Now, then You Aren't Watching the News! I took a short break from posting to the Rollins Financial blog since my principal editor is on maternity leave. Once again, Jennifer Wilcox had to come up with some poor excuse for missing work such as having her second baby. Since Jennifer has worked for me off and on for the last 16 1/2 years, I accepted her excuse. Congratulations Jennifer and Eddie! There’s no way to sugarcoat the third quarter of 2011 – it was a financial disaster. However, as I indicated in prior posts during the quarter, I was never particularly concerned because all the reasons given for the sell-off in the third quarter appeared to be completely exaggerated. I continue to believe that the main reason for the sell-off was that the momentum buyers were pushing the market down to fool investors so they could purchase stocks at a better price when investors sold. Even though the quarter was painful, hopefully you stayed invested and were able to enjoy the upturn at the beginning of October 2011. Whenever the market turns straight up at the end of a volatile quarter, it’s apparent that speculators are controlling the market and not investors. That is exactly what happened in the third quarter of 2011, and this ultimately created the big turnaround in October 2011. For the month of October thus far, the Standard & Poor’s Index of 500 Stocks is up greater than 8%. Additionally, the international emerging markets are starting to rally. Many of the reasons given for the market sell-off in the third quarter of 2011 have now been proven unfounded, and therefore, the markets are rallying. You may recall that in August and September of 2011, many economists were screaming that the U.S. was falling into a recession. Additionally, we repeatedly heard the proclamation that the earnings for the third quarter would be disastrous given the uncertainty of Europe and the potential slowdown in China. The financial media was also reporting that Europe was starting to implode. I read and heard more articles on the ultimate demise of Europe then on any single subject. However, the scare tactics that were relayed regarding the potential default of Greece were not even believable given the lack of financial exposure the U.S. had to the country of Greece. As we roll into the third week of October, now we find all of those supposed fears were definitely exaggerated just as I predicted. In fact, it looks like for the third quarter of 2011, the GDP in the U.S. will be 2.5%. That’s certainly not great, but it’s not negative, either. Those economists who forecasted a negative GDP growth must feel really bad today – if they are smart enough to even realize they were wrong. An additional number of financial analysts told us in no uncertain terms that the earnings of the U.S. companies would be disastrous for the third quarter given the financial turmoil of Europe. Once again, they could not have been more wrong. For the third quarter, most of the major U.S. corporations have already reported their earnings. To this point, 75% of the reporting companies have exceeded their estimated earnings. Quite frankly, earnings of major U.S. corporations have been nothing short of breathtaking. There used to be a time when corporations would report adequate earnings of hundreds of millions of dollars. Today, it is not unusual for major corporations to report $5-$6 billion in net income for a given quarter. Never in the history of the U.S. financial markets have earnings been so spectacular. Corporate U.S. balance sheets border on unbelievable with the extraordinary cash accumulations. Apple, Inc. recently announced they have accumulated in excess of $80 billion in cash on their balance sheet with no presumed need for it given their profitability. This is a corporation that will very likely generate a $15 billion net profit for this year and throws off $20 billion of internal cash flow. I guess there is a reason why this is the largest capitalized corporation in the U.S. The list of cash balances goes on from Microsoft’s $52 billion to Cisco’s $32 billion and on and on. It was reported before this quarter that U.S.-based corporations had on their balance sheets roughly $2 trillion in cash – and that figure continues to grow this quarter. Therefore, the multiple items that were holding back the equity markets in the third quarter seem to have moved to the positive in the fourth quarter. Corporate earnings are spectacular and are growing. It was particularly unusual during the third quarter 2011 that even the safe-haven type investments suffered losses. In fact, almost every type of mutual fund, both conservative and speculative, lost money during this quarter. 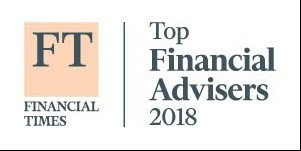 We normally use a fair amount of high yield bond funds for our clients since they pay a rate of return much in excess of cash and are fairly conservative. It was unusual during the third quarter that even these types of bond funds suffered large losses. Some of these bond funds were down for the quarter roughly 7-10%. There is no economic justification for this type of loss in these types of bond funds. With corporate America generating record profits, the default on these bonds will be less than 2%. The type of losses incurred in this third quarter can only be explained by investing based on fear. There was no economic reason for these types of losses – people weren’t investing based on common sense. If you review the vast number of mutual funds that are available for purchase, you will see that the only type of mutual fund classifications that were in positive territory for the third quarter were mutual funds backed by the U.S. Treasury bond and a few gold-based funds. Virtually all growth equity funds, all international funds, and most blended funds, had losses of 20% or greater for the third quarter in 2011. It was just a brutal period not justified by the economy. The economic view has all of a sudden gotten better in October. Corporate profits are still outstanding and interest rates are low, and all of these positives should provide superior investment returns in the fourth quarter. Actually, my previous projections of double digit returns are still not out of the question. The only potential hold-up for this projection is the news from Europe. For whatever reason, the Europeans cannot seem to make a definitive resolution to their problems. If this issue drags on for another three months, it would endanger the fourth quarter 2011 performance. However, I don’t anticipate for Europe to be that indecisive. As you can see, there is blatant uncontrolled growth of expenditures. While revenue has decreased in the years during the recession, outlays have exploded! The one major hold up of the U.S. economy is the risk that the Federal government has on our economic future. 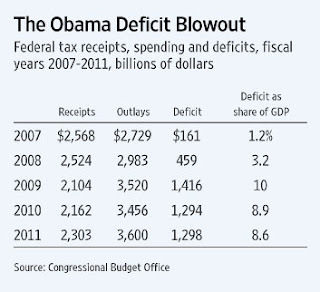 Note that in 2007, the Federal deficit was only $161 billion. It’s hard to believe that any government could take responsibility for blowing the deficit up ten times in such a short period time. At the end of 2011, we have had three straight years of deficits in excess of $1 trillion. Sadly, our economy is no better for the money that’s been spent. The other item that is important from this chart is that the Federal budget can never be balanced by increased receipts. There is not enough income to be taxed in the U.S. to do balance the budget. The only way it could possibly be balanced would be to reduce expenditures to 2008 levels with some minor increases in taxes. Therefore, if you ever hear any politician indicating that the Federal government cannot cut expenditures to balance the budget – something I heard at least four times yesterday on the nightly news – they are lying. Even with all the negative news in the financial press, it’s highly likely that the U.S. stock market is now in a rally mode which could go on through the spring of 2012. I know it seems impossible to believe with all the negative news that the equity market could increase, but as I have pointed out many times before, the equity markets grow with higher earnings and lower interest rates. There has rarely been a time when each of those components is so favorable to higher stock prices than what we are currently experiencing.